I have a solar tube water heater that is non-pressurized wit a gravity feed of the hot water. I am in the Caribbean where we rely on storage tanks that use a water pump to pump water into the house. In this case the pump also feeds the solar water heater. My question is this, the cold water going into the house is pressurized by the pump while the hot water is gravity fed from the solar heater. Will the pressurized cold water pressure over power the hot water gravity feed when I open my shower or sink mixer? It's going to depend on your plumbing, but if your collector is under pressure from the pump, then it's output would be under pressure too, and your mixer valve would probably work normally. Do you have a diagram? Sorry I forgot to respond about the pressure. So the cold water line feeding the heater is pressurized from the same water pump feeding the faucets and showers. 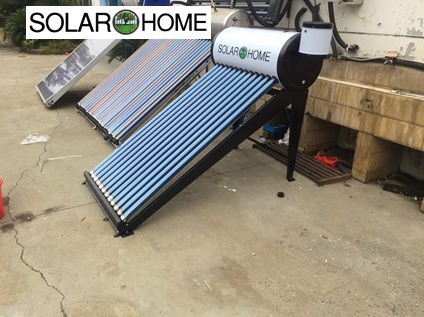 The hot water line from the solar water heater is non-pressurised gravity feed. The question is will the gravity feed hot water be overpowered by the pressurized cold water being pushed by the pump, to the extent that the hot water does not come out? I understood that. But if you don't have some way of "depressurizing" the tank, it either WILL be under pressure or it WILL overflow. Your diagram is inaccurate in that it does not show a pump OR where it is. As drawn both hot and cold are gravity. If you have a pump on the cold side but not on the hot, cold water will flow into the water heater and overflow it. A. You could install a check valve to prevent this, but you may not get any hot water at all. B. IF the water heater can take the pressure from the pump you can pressurize it with the same pump. Mine is connected this way, but CONTACT THE MANUFACTURER before you try this, you could rupture the water heater. C. Another solution would be to install a second pressure pump on the hot water line, but check that the pump can take the heat.